Myers’ legacy included building the university’s long-term financial health and developing the human resources, facilities, and grounds to support AU’s academic programs and aspirations. Donald L. Myers, American University’s CFO, Vice President and Treasurer, died on January 6, 2014, after a long struggle with cancer. He was 68 years old. Myers had an extraordinary career at AU that lasted four decades, including 32 years as its chief financial officer. He served six presidents. His legacy included building the university’s long-term financial health and developing the human resources, facilities, and grounds to support AU’s academic programs and aspirations. Introducing financial safeguards that saw the university through an acute financial crisis in the 1980s, Myers worked with AU leaders and the Board of Trustees to build the financial health of the institution. Under his leadership, the university was one of the first to adopt many of the Sarbanes-Oxley regulations, even though non-profits were not required to do so. With the Board of Trustees Finance and Investment Committee, he developed an investment approach that substantially built the endowment. Myers was proud when AU earned A+ (S&P) and A2 (Moody’s) bond ratings and suffered no cuts to the operating budget during the nation’s most severe economic downturn since the Great Depression. Myers’ effective financial planning enabled the university to continue offering competitive compensation and benefit increases to its faculty and staff when other universities were furloughing or freezing pay. During his tenure as CFO, the university’s endowment increased from $7 million to $550 million; the operating budget grew tenfold to $600 million; and total assets increased fourteen-fold to $1.4 billion. A first-generation college student who worked on a farm, Myers was attuned to the issue of college affordability, especially for the neediest students. He kept an eye on the relative price of tuition, advocating for a long-held AU position at the midpoint of peer institutions. Most recently, he and the university’s provost led AU’s Budget Committee in 2012 to recommend the lowest tuition increase on record. He also supported an increase and shift in financial aid from being primarily merit-based to a balanced portfolio of merit and need-based awards. Myers also personally supported students through philanthropy, establishing in 2003 an endowed scholarship in the Kogod School of Business, his alma mater. Using AU’s financial stability and reserves, Myers focused on developing facilities and grounds to support the university’s academic mission. Since 1982, the university’s facilities have doubled to 4 million square feet, with another 1 million square feet in-progress. The School of Communication’s move to the renovated McKinley Building this month makes it the latest school to move into new academic facilities. A new home for the Washington College of Law at the Tenleytown campus is well underway, slated to open in Fall 2015, and plans are well along for the new East Campus project, scheduled to open in 2016. The university’s development has also been recognized for its beauty and sustainability. Myers’ team sought and received the designation of the campus as an arboretum in 2003. All of the new facilities are built to earn a minimum LEED silver standard, and the new School of International Service building earned gold. The university’s sustainability and green power programs have made it possible to meet the President’s Climate Commitment to be carbon neutral by 2020. 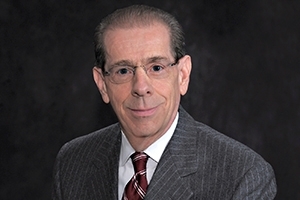 Myers’ leadership in bringing American-style higher education to parts of the world where it is in demand or most needed resulted in partnerships with new universities in the Middle East and Africa, which facilitated their growth, led to the full U.S. accreditation of one institution, and placed the other on a path toward that end. At home and abroad, Myers made a lasting impression. In 2013, the Washington Business Journal honored Myers with its Lifetime Achievement Award (video). On that occasion, he noted how gratifying it was to help the university he loved to achieve such significant growth. Originally from Hagerstown, MD, and a graduate of Shepherd College (now Shepherd University) in West Virginia, Myers started at AU as an entry-level accountant and earned his MBA in Finance in the evening program at AU. Myers is survived by his wife, Margie; two sons, Curtis and Charlie; a daughter, Tracey; granddaughters, Elyse and Allie; grandsons, MJ and DJ; and two brothers, Ronnie and Larry. Board of Trustees Chair Jeff Sine said, "For more than forty years, Don Myers’ impact on American University was profound and transformative. His commitment to AU, our students and our faculty was abiding and absolute. The Board joins the rest of the AU community in expressing our profound sense of loss and sorrow over the passing of a great man." Next week, the AU community will celebrate Don's life, honor his legacy and express our condolences to his family through visitation hours and a memorial service. On Wednesday, January 22, Don's family will receive visitors at Joseph Gawler's Sons at 5130 Wisconsin Avenue, NW, between 2-4 p.m. and 6-8 p.m. Condolences may also be expressed in the online guest book. In lieu of flowers, contributions can be made to the Don Myers Memorial Fund at American University. On Thursday, January 23 at 3 p.m., a memorial service will be held at Metropolitan Memorial United Methodist Church at 3401 Nebraska Avenue, NW. Parking will be available in the university's Nebraska Avenue parking lot, across the street. A reception will follow at the University Club in the Mary Graydon Center on campus.